We offer a variety of fiberglass styles (round, square, half round and rectangular), products (trash cans, planters, ash & trash, benches and smoke urns) and finishes including the Standard Gel-Coat, Matte, Dura-Tone, Gran-X and Sand-X finishes, which are all suitable for indoor use. 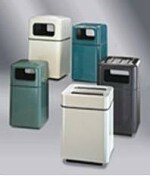 Also offered are Endura-Crete finishes, which are suitable for outdoor receptacle installations. Dura-Tone is an extra durable finish that provides a sophisticated comination of texture and colors. Great for high traffic areas and has superior resistance to stains and scratches. Concrete Fiberglass finish is textured to have the look and feel of concrete at a fraction of the weight. It's rugged durability makes it ideal for outdoor use. Superior resistance to stains and scratches. Withstands hard and constant use. Optional anchoring kits provide stability when finish is used for outdoor installations. Custom color matching and designs available. Many of the models with two openings are available with a single opening as a custom order. FM Approved Fire Safe/Self-Extinguishing receptacles available. Many come with optional Fire Retardant treated and certified. Fiberglass products are manufactured through a process of open molding or laminating of thermosetting plastics to produce what are known as fiberglass reinforced and composite plastics. The most common products are fiberglass boats, but other products include furniture, corrosion resistant equipment, cultured marble bath fixtures, bathtubs, heat exchanger components, floating pier modules, large storage tanks, truck body components, and machinery housings. 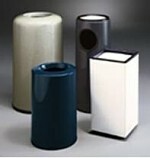 This sector includes information on several fiberglass production methods, including open mold laminating using spraying or rolling techniques, closed molding, rotational molding, infusion, vacuum bag molding, and UV curing, among others. Specifically addressed are the issues of handling hazardous materials and contaminated solvents, and controlling air and particulate emissions.